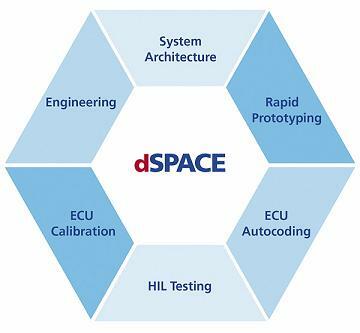 dSPACE develops and distributes tools for the development of ECUs and mechatronic systems worldwide. Using dSPACE systems, manufacturers of controllers and electronic control units (ECUs) are able to dramatically reduce their development times and costs, and systematically increase their productivity. Whether the objective is an electronically controlled diesel injection, fuel cell vehicles or hybrid electrical car, virtually all car manufacturers and many of their suppliers rely on dSPACE hardware and software in their current development projects. dSPACE tools are also used in aerospace, drives technology, medical technology, industrial automation, and other fields. The company also provides comprehensive services from on-site user training to customer-specific system engineering such as turn-key HIL test systems. dSPACE has more than 800 employees worldwide at its headquarters in Paderborn, in the Project Centers at Munich and Stuttgart, and also in the subsidiaries in France, the UK, Japan, the USA and now in China.